Too often, the client's segmentation scheme reflect normalized abstractions rather than the evolving needs, tastes, and practices of real people. For our India mobile phone client we proposed a rather different model. At the end of the day, we wanted more time in the field than the client was willing to support (at least this time). But we think it would have been time well spent. We suggested that our team identify ethnographic segments, drawn from observed patterns of practice and meaning within a particular strategic domain--in this case, the strategic domain was “basic” phone users (people who are buying inexpensive phones). We use male or female gender as a major sub-segment because of the continued importance of gender in structuring consumption in India and elsewhere. Our ethnographic research--observation and secondary contextual research supporting user interviews and participant observation--was designed to identify patterns within a gendered basic-user target. Ethnographic segments would be identified on the ground, not pre-selected from a quantitatively derived market segment as is usually the case. (And as the client really seemed to want.) The contexts of use for both men and women within these segments would add a real-life dimension to our presentation to marketers and designers. 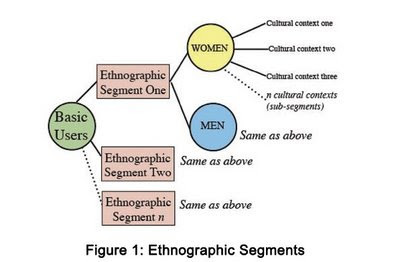 Using ethnographic segmentation (it might be more clear to simply call it segmentation by contexts, but what the heck) would help product design and marketing by discovering patterns within segments that are not static but can be dynamic and context-sensitive. Strategic decisions in our proposal would have focused on two or three broad cultural contexts of use, or to might have included include additional fine-grained contexts. We provided our client with this visual model of what we were trying to convey (Figure 1, above). • Design researchers don't sample only individual people. They sample contexts and people, both. • Design researchers try to determine the range of contexts in which things are happening, in which products are used, or related needs or activities take place. Sample there. Within these contexts, anthropologically-leaning design researchers find out what the meaningful sorts of people are who are part of the world in which these goings on are happening. It makes sense, then to think about people after you have determined where you are going to go, which contexts you want to visit, and, in consultation with your client, which contexts will be the most strategic for the organization to understand and design around. It isn't people alone. Its people and contexts that provide the meaning behind people's actions and desires. Designers want meaningful scenarios that are rich in the local complexities of daily life, the complexities that people take into consideration when they decide to do this or that, to organize their lives or their thinking in one way or another, or even to buy a new ring-tone for their mobile phone or not.